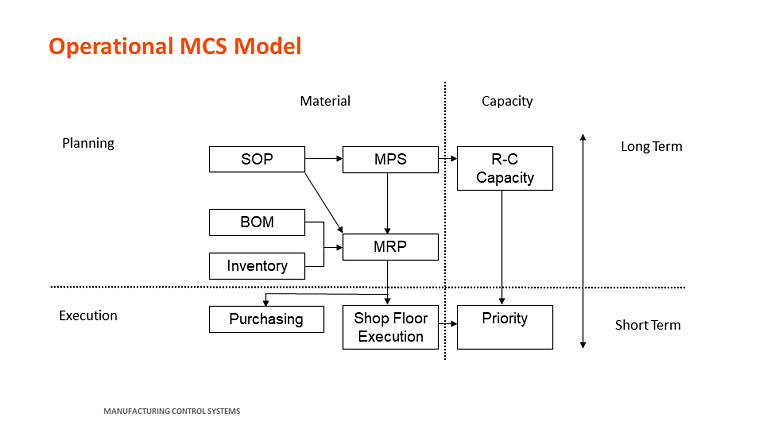 The Manufacturing Control System (MCS) model provides the structural foundation for the implementation of today's Enterprise Resource Planning (ERP) software packages. This fundamental model can be used with almost any commercially available ERP system on the market today, and should be easily explained by anyone at your organization. In this blog post, we will review the planning stage of the model. There are two dashed lines in the model. The horizontal dashed line separates planning from execution. Planning is aligning all resources across lead-times, but not reacting to those plans. Execution is executing those plans. All components above the line are therefore planning functions. Those below (i.e., Purchasing and Shop Floor Execution) are execution functions. The vertical dashed line separates materials and capacity. The left side of the line is concerned with materials (i.e., having the right part at the right place at the right time), while the right side is concerned with capacity (i.e., assuring we can execute the material plan). The top of the model is concerned with a longer time horizon than the bottom of the model. As it moves downward vertically the time horizon becomes shorter. In other words, the Master Production Schedule (MPS) may extend out six months to one year, while Shop Floor Execution (SFE) is only concerned with the next few weeks. All horizons are determined by lead-times for both made and purchased parts. The balance of this post will review the major components of the model. You can learn more about the purpose of the model Each section contains an abbreviation in square brackets that corresponds to the respective model component. This component is concerned with the activities of customer service, quoting, sales order entry and promising, and often shipping. The arrival of actual orders is often compared against the original forecast to determine the error rate of the forecast. Actual sales orders are passed to the Master Production Schedule (MPS) for master scheduled parts (if used) and are seen directly by Materials Requirements Planning (MRP) for MRP planned parts. Sales orders represent promises made to customers. The MPS represents a statement of supply for each end item. Forecast orders are used to drive missing demand where customer orders do not cover the cumulative lead-time. The fundamental rule is that supply must equal demand for the period with respect to available capacity. This means that there may be periods of time where supply and demand are not perfectly balanced due to either material or capacity limitations. Once established, the MPS is said to drive Material Requirements Planning (MRP). Note that when the MPS is not used, sales orders can drive MRP directly. This is a common practice in Make to Order (MTO) environments, but must be managed properly with respect to driving supply schedules (i.e., the sales plan must be complete, stable and cover cumulative lead-times). When used in conjunction with forecasts, “consumption” must also be managed. Extending bills of labor information from the Bills of Material table, or directly from the Part Routing in the Shop Floor Execution component, by the order quantities in the MPS results in a stream of requirements (in hours) for critical production work centers. Summarizing this data in weekly buckets allows the impact of material plans to be assessed on resources in future periods. This process is said to "validate" the MPS. The BOM component catalogs all parts used in the system and their corresponding component part strategies (i.e., make or buy, lead-time, costs, planning policies, etc.). Manufacturer’s Part Control (MPC) is also an integral part of the component part strategy in many industries. The BOM itself records information of how the products go together (i.e., parent-component relationships) and the timing (i.e., effective dates) and quantities required in each. These relationships setup “dependent” demand required for MRP. Major topics for this area are types of BOM's and the issue of how many levels. Once established, BOM’s must be accurately maintained under a formal Engineering Change Order (ECO) system. Contains information for stocking locations and the quantities stored there. A stockroom can be defined as a single bin of parts or a finished goods warehouse. To accurately reflect on hand balances, transactions must be designed and controlled under an Inventory Transaction Processing System (ITPS). The heart of today's MCS, this function basically does all the mathematical planning computations. It multiplies the MPS quantities by the BOM quantities and offsets by lead times, creating a gross requirement. It then "nets" those requirements against on-hand inventory and scheduled receipts (from Purchasing and Shop Floor areas), thereby obtaining net requirements. Two major outputs of MRP are planned orders (i.e., the Net Requirement is greater than 1) and exceptions (i.e., pull-in and push-out messages for scheduled receipts). The “order release” mechanism is used to move planned orders into the execution components that follow. This is part one of a two part blog series. Learn more about the Execution side of the MCS. 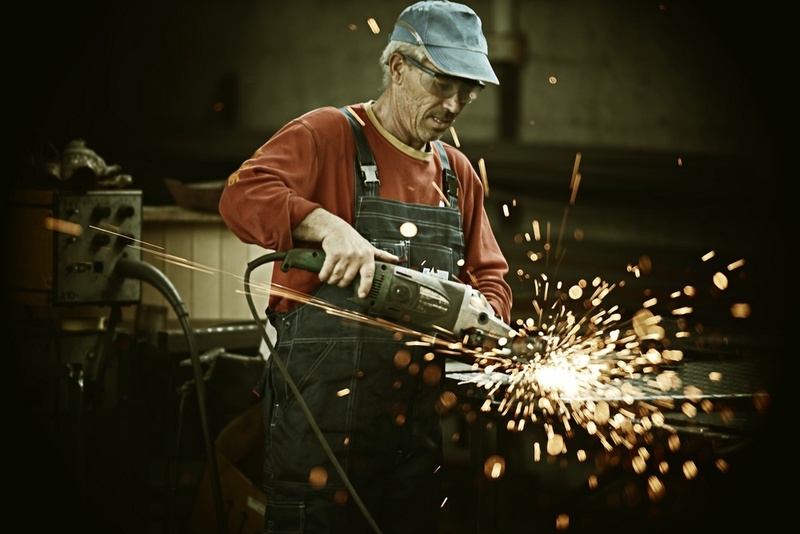 This article reviews the Manufacturing Control System, referenced in a previous webinar. Please or on the image below to view an on-demand recording of that webinar. Thanks you for taking the time to read our post. If you have any questions regarding Manufacturing Control Systems, please feel free to leave them in the space below.